The Yellow-eyed Penguin Trust hosted a practical workshop on mustelid control techniques in August 2000. 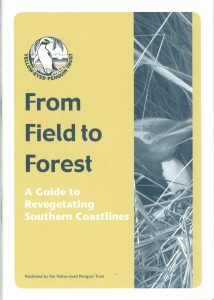 At the request of attendees, a follow-on field guide was published by the Trust in 2002 and revised in 2005. 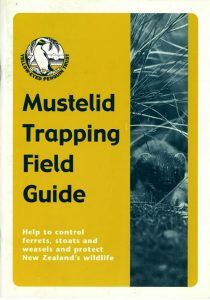 This A5-sized booklet, which outlines the biology of the mustelids (stoats, ferrets and weasels) including reproduction, diet and range, signals the implications of predator guild relationships. Placement of traps (when, where, how many), technical aspects of trapping and types of traps are all discussed. Included are sample data recording sheets, and explanations about the importance of accuracy of records, including recognising nil returns. The legal obligations under the Animal Welfare Act are also included in this booklet. Aimed at both amateur and experienced trappers, the Trust hopes it may assist in the practical eradication of one of the threats to the rare hoiho and other endemic species. This is a great guide for those landowners who may have penguins on their land, and want to know the best way to ensure that the penguins will be safe from stock and predators. Compiled by staff and trustees of the Yellow-eyed Penguin Trust, this booklet summarizes their experiences in habitat restoration since 1987. It is a non-technical guide for anyone protecting native plant habitats, particularly those in southern New Zealand. It is as equally suitable for small scale planting in a coastal garden as for the recovery of an entire penguin nesting habitat.